The 2018 Fleet World/ALD Automotive MPG Marathon takes to the roads today, testing compliance with the new ‘real-world’ WLTP fuel economy cycle in a range of petrol, diesel, hybrid and electric vehicles. Now in its 18th year, the MPG Marathon has carved out a place in history by showcasing how manufacturers’ official fuel consumption figures can be significantly beaten with the help of a few useful tips and small changes to driving style. During last year’s two-day event, a Ford Fiesta 1.5TDCi (120PS) Titanium – driven by the BBC’s South Today’s Transport Correspondent, Paul Clifton and co-pilot Ian McKean – broke 120mpg, while a Ford Fiesta 1.0 (125PS) EcoBoost Titanium nearly topped 100mpg. This year’s event, which is sponsored by ALD Automotive along with RAC Business, IAM RoadSmart and Airmax Remote, will be the first to be based on fuel economy figures derived under the new Worldwide Light vehicles Test Procedure (WLTP) homologation cycle. This longer, higher-load test is aimed at better replicating real-world driving conditions than the New European Drive Cycle (NEDC) it replaces, and manufacturers have been re-testing their model ranges since it came into force in September 2017. 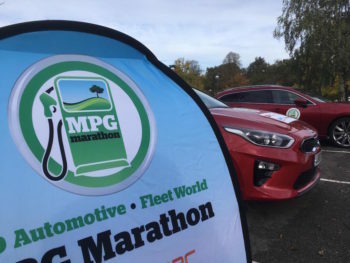 The MPG Marathon will test vehicles shortly after the test became mandatory for all new car – except a limited number of run-out models – as of 1 September 2018; a process which has brought an unseasonal fall in registrations as manufacturers struggled to meet the testing deadline. Fleets are also reported to have been holding off on new car purchases due to tax uncertainty as HMRC looks to switch to new formats of VED and Company Car Tax for WLTP-tested cars from April 2020. But more realistic CO2 and fuel consumption figures could also be to blame. Although tax bands for WLTP won’t be brought in until April 2020, the figures for WLTP-tested cars are being converted to an ‘NEDC Correlated’ figure that in many cases is higher than the genuine NEDC figure used before. CO2 figures generated by Jato in April showed an average 8g/km uplift to NEDC Correlated figures – more recent test data, regarded as more robust as it included increased vehicle numbers, showed a difference of 9.6g/km, bringing increased taxation charges, despite the cars being mechanically identical. All of which means that this year’s event, which is once again being held at the Forest of Arden Marriott Hotel & Country Club in the East Midlands, will pile the pressure on drivers to see if they can improve on the WLTP-tested fuel figures – and will shed light on how realistic such figures are. This year’s entrants include petrol, diesel hybrid and fully electric cars, testing almost the full spectrum of fuel options available to fleets. For a sneak preview of how contestants are getting on, visit the MPG Marathon Twitter account here, or follow live updates at thempgmarathon.co.uk.